UPDATE: You can read the Introduction here. 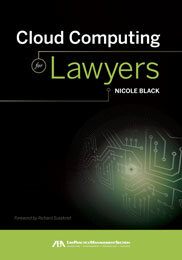 My latest book, "Cloud Computing for Lawyers" is now available at the ABA's online store. You can pre-order it here. It will start shipping at the end of this month. I'll be speaking on at panel at LegalTech New York on January 30th and will have copies with me, so you'll be able to take a look if you happen to attend LegalTech this year. There will also be a "Meet the Author" session at ABA TechShow on March 30th at 1:45 and copies of the book will be available for purchase at TechShow. I'm thrilled that this book is now available and am so thankful to all of my friends and colleagues, both online and off, for their support as I wrote this book. Couldn't have done it without you! 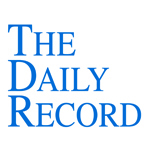 This week's Daily Record column is entitled "Virtual Law Offices: California Weighs In." Virtual law offices are a relatively new, emerging concept, but fortunately for legal practitioners, a number of ethics committees are slowly but surely addressing the ethical issues surrounding the practice of law via an online portal. Most recently, in November 2011, the State bar of California Standing Committee on Professional Responsibility and Conduct addressed the ethics of maintaining a virtual law office in a draft formal ethics opinion (No. 10-0003) (See: www.calbar.ca.gov/Portals/0/documents/publicComment/2012/). This proposed opinion was handed down on November 5th and then opened up for a 90-day public comment period. Before addressing the ethical issues posed by VLOs, the Committee acknowledged that the cloud-based technologies used by VLOs are similar to the cloud computing software used by some traditional law offices and thus its many of its conclusions in the opinion applied equally to VLOs and brick and mortar offices using cloud computing services. However, because the hypothetical VLO at issue was solely virtual with no brick and mortar components, it presented unique ethical issues which would require due diligence considerations specific to VLOs. The Committee listed a number of factors that an attorney must address when choosing a VLO cloud computing provider, including: 1) the credentials of the vendor, 2) data security issues, 3) whether the cloud vendor will transmit client data across jurisdictional boundaries, 4) the attorney’s ability to supervise the vendor, and 3) the terms of the contract with the vendor. The Committee stressed that these obligations are continuing and the attorney must continue to reassess these issues, as needed, throughout the term of the contract with the vendor. The Committee also advised that client consent regarding the storage of client data on a third party server was not required in regard to the hypothetical VLO discussed in the opinion, since that system was password protected and encrypted, and each client was permitted access only to his or her own matter. However, the Committee cautioned that a different type of VLO set up might require client consent, as might changing security standards over time, and thus the issue of client consent must be carefully considered based on the specific technology set up of the VLO each time an attorney establishes a virtual law practice. The Committee also addressed, at length, the unique ethical issues presented by the delivery of legal services through a VLO. These obligations include ensuring that the intake process provides both the attorney and the client with sufficient information regarding legal services to be provided and the scope of representation. The attorney must also ensure that the client has an understanding of and access to sufficient technology to support representation via the VLO. Finally, the attorney has an obligation to keep the client sufficiently informed of the status of the matter and to adequately supervise “subordinate attorneys, and non-attorney employees or agents” even if those employees operate out of different physical locations. All in all, this proposed opinion provided a very thoughtful and detailed analysis of the ethical issues presented when an attorney establishes a virtual law practice. The only aspect of the opinion that troubled me was the suggestion that, in some cases, lawyers who outsourced the storage of confidential client data to third party providers might need to obtain client consent prior to doing so. Client consent is generally not a requirement when attorneys outsource the storage or handling of confidential client data in paper format, such as when storing old paper files in a warehouse or providing a process server with confidential documents. Electronic data should be treated no differently simply because the confidential information is stored in a different format. The suggestion that, in some cases, it might be treated differently in the future does not bode well for cloud computing and sets dangerous precedent. That being said, aside from that one issue, this is a well thought out opinion that provides legal practitioners with a helpful overview of the ethical issues presented by VLOs and offers useful guidance for attorneys considering establishing this type of law practice.